It installs anywhere that you have space: adjacent to your wine cellar, above your wine cellar or up to 25 feet away from you wine cellar. It provides complete and effective forced-air cooling that's fully thermostatically controlled. Our incredible new Wine Guardian is the most versatile cooling system you can buy. It installs anywhere that you have space: adjacent to your wine cellar, above your wine cellar or up to 25 feet away from you wine cellar. 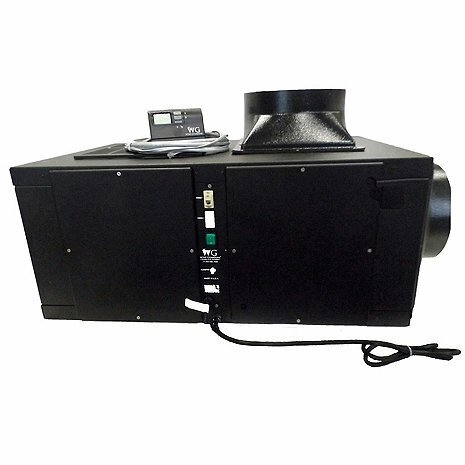 It provides complete and effective forced-air cooling that's fully thermostatically controlled. Optional humidification is available for dry climates. Best of all you can install it yourself. Size: 14H" x 22W" x 39L"
Maximum Room Size in Cubic Feet: 3000 Cu. Ft.
What type of power capacity does this need? 110 or 220 volt? How many amps? BEST ANSWER: The electrical power supply must be either 115 volt or 230 volt AC 1 phase 60 cycle, depending on the model of the unit, and cannot vary more than +/- 4% or damage may occur to the unit. Thank you for your question. The 1 ton unit requires 220/230 volts. A 15 amp dedicated circuit is required. Any other questions please call us at 1-800-377-3330.